Monitor mail transaction from send to mailbox and ensure your mail systems are delivering mail efficiently. 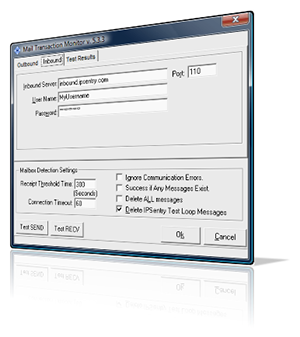 While ipSentry provides the ability to test your SMTP and POP servers to insure connectivity and communications, the Mail Transaction Monitoring add-in goes many steps further. This added feature will send periodic test messages through your selected email relay server and then periodically check the destination mailbox to ensure that the message has arrived. If the message is not found within the specified amount of time, configured alerts will be triggered. This add-in is ideal to insure that your message queues are not blocked as well as ensuring that the inbound server is accepting messages. Connection to mail relay host can be established. Mail server is accepting messages for delivery. Mail server is delivering email. Mailbox server is accepting email. Mailbox is accessible and responding. Mail can actually be retrieved from the mailbox. That the mail is actually being delivered in an acceptable amount of time as configured in the add-in. Even when the services are reporting OK and the performance counters show normal, and your network connections are all up and running, for some reason - the mail just stops. The Mail Transaction Monitor will let you know there is a problem because it spends it's time doing nothing but sending mail and waiting for it to get to the mailbox. You can configure this monitor to be very patient or extremely impatient by setting the timeout threshold as to what time frame is acceptable for mail to be sent to the specified relay via SMTP or MAPI (Exchange) and then received in the destination mailbox via POP3 or MAPI. Whether it is your mail queue or your service providers mail queue - if there is an unacceptable delay in delivery, you will be the first to know.